One of the most interesting phenomena in history is a population thinking that it is free when it is ruled by a dictatorial plutocracy. This phenomenon manifested itself this week with the Bush administration’s proposal of a massive bailout package for failing Wall Street companies. Some members of Congress on both sides of aisle expressed concern about suddenly dumping $700 billion onto failing Wall Street firms. The top Republican in the committee, Sen. Richard Shelby of Alabama, stated his concern about the plan’s cost, and doubted whether it will even work. The plan was such a sweet deal for Wall Street, even car companies wanted in on the bonanza. There was no evidence that the banks would put repeat their mistakes again, and put their money in another economic bubble. Another concern was that Paulson is leaving office in four months, enough time to escape potential negative consequences of the plan. Paulson’s plan pays in cash the price on the bank’s books for the subprime mortgage-based assets. The book value is probably a high percentage of the total balances owed on the underlying mortgages. Paulson’s price for the subprime mortgage-based assets is favorable to the banks. If Paulson’s price for the subprime mortgage-based assets was not favorable to the banks, the banks would not sell. Neither Paulson nor the banks have presented any rationale, much less a convincing argument, for the proposition that the U.S. is on the brink of financial chaos. They have declared it to be so. No one is guaranteeing that any recovery can be made on the subprime mortgage-based assets (in excess of the cost of collection), no one is guaranteeing that the banks will lend after a bailout, and nobody is even suggesting that this bailout, the one currently proposed, is the only one that will be necessary. The pretense is that not to pay them off would threaten “the economy.” The reality is that it only would stop their predatory behavior. Worse than that, for the economy at large a government take-over of these bad loans would prevent the debt write-down that the economy needs (The Insanity of the $700 Billion Giveaway)! In other words, the Paulson plan is explicitly for artificially insulating the economic status quo from market reality – merely pushing back the inevitable day of reckoning (Johnson, Rad Geek.com). “The secretary and the administration need to know that what they have sent to us is not acceptable,” said Committee Chairman Sen. Chris Dodd. There was not enough protection for taxpayers, and it did not sufficiently address the continuing mortgage problem. Paulson’s plan also rejected limits on executive compensation, and that the government should get equity share in exchange for the massive capital. The plan would amount to American taxpayers paying for the years of deregulation, mistakes, and greed of the rich private investor class on Wall Street while the budget deficit inflates, and the value of the dollar sinks even lower. 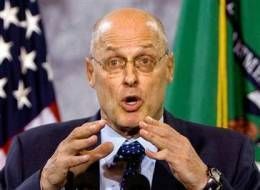 Henry Paulson and Fed Chairman Ben Bernanke testified before the Senate committee on Tuesday. And, on Wednesday afternoon, they spoke to the House Financial Services Committee. Some Senators were outraged by Paulson’s plan when they read Section 8, which is a naked power-grab by the Secretary (and the Bush administration) that essentially puts Paulson outside the law. It proposes no oversight accountability, or any judicial review of Paulson decisions. When asked by the Senators about why he added no government oversight to the plan, Paulson said he thought it would be “presumptuous” of him! It would have been “presumptuous” if anyone else believed the opposite of what Paulson wrote. Section 8 is “a provision that evokes the Bush administration’s suspension of normal constitutional safeguards in its conduct of foreign policy and national security,” said Robert Kuttner in American Prospect. Section 8 reads: “Decisions by the Secretary pursuant to the authority of this Act are non-reviewable and committed to agency discretion, and may not be reviewed by any court of law or any administrative agency.” The fact that major corporate media outlets did not give even an inkling of notice to this proposal is a flat-out astounding display of their failure to inform the People of this Republic, and a failure in their duty to act as the Fourth Estate. Section 8 is a singularly transformative sentence of economic policy. It transfers a significant amount of power to the Executive Branch, while walling off any avenue for oversight, and offering no guarantees in return. And if the Democrats end up content with winning a few slight concessions, they risk not putting a stop-payment on the real “blank check” – the one in which they allow the erosion of their own powers. This section of Paulson’s plan is blatantly unconstitutional, and erases the system of checks and balances in the Constitution. Voting for Paulson’s proposal in its original form is an impeachable offense for any public official. Make no mistake that the bailout would be another symptom of the slide of this Republic towards oligarchy. A bailout that will balloon the budget deficit, with no guarantee of recouping the infusion of capital, and no means of holding those who fail to do so accountable is a shockingly audacious and imprudent proposal. It was a victory for democracy on Monday, when the plan was defeated in the House because of the massive expression of popular outrage. It was a defeat for democracy when the Senate approved the plan yesterday by a wide margin. Whether this plan succeeds or not will have long-lasting effects on American capitalism, and will determine whether money triumphs over democracy. – Require the Treasury Department to work to restructure many of the mortgages it purchases to aid homeowners facing foreclosures. Negotiators dropped a provision sought by Democrats to allow judges to reduce mortgage debt in bankruptcy court. – Curtail so-called “golden parachutes” to departing executives at firms that sell assets to the government. – Allow the government to take an ownership share in companies that sell assets to the Treasury Department, to ensure that taxpayers share in any possible profits from the program. – Set up a series of oversight boards to keep tabs on the Treasury Department’s management of the program, and requiring electronic filing of asset sales and purchases. The vote is just the beginning of heightened Congressional action. House committees have already scheduled hearings to examine the causes of the historical turmoil in credit markets, to investigate whether oversight of sophisticated credit products is sufficient and to start to work out a plan to revamp the nation’s financial regulatory system. Both parties came through strong in delivering vote switchers. Democrats increased their “yes” votes from 140 to 172, while Republicans increased their ranks from 65 to 91 on the prevailing side. There were 108 “no” votes on the Republican side while 63 Democrats voted against the legislation. Monday’s 228-205 defeat in the House sent Wall Street into a tailspin, followed by a bipartisan effort to jump-start the process again in the Senate, which approved the plan 74-25 Wednesday night. Along the way, popular tax breaks and aid to rural schools were added to win support, at a cost of more than $105 billion next year. And to reassure middle-class families scared by bank failures, the bill temporarily raises federal insurance for savings deposits of up to $250,000 – compared with $100,000. Going forward now, Treasury will have immediate authority to invest $250 billion and little trouble getting a second installment of $100 billion. But Paulson will be subjected to much greater oversight than he first proposed, and a future Congress could potentially deny any funding beyond the first $350 billion authorized in the legislation. Taxpayers are promised a greater chance to gain some equity interest in the companies benefiting from the government aid. And new restrictions are imposed on executive pay and severance packages for those firms that sell more than $300 million in securities to the government. Treasury official admit that it will take several weeks to begin to put the program into effect. And together with Federal Reserve Chairman Ben Bernanke, Paulson is exploring how best to use new auction mechanisms to not only guide the government’s investments but also shed new light on the real value of assets suppressed to “fire sale” prices after the collapse of the U.S. housing bubble. As a practical matter, Treasury will also have to sell bonds to raise the money, meaning Paulson’s early investments may be limited to just $50 billion a month. And for this reason, the real future of the initiative could rest on whomever succeeds President Bush in January. ~ by jsacc001 on October 3, 2008.